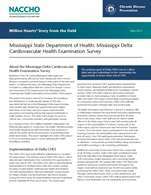 This is a Million Hearts® Story from the Field about the Mississippi State Department of Health: Mississippi Delta Cardiovascular Health Examination Survey. The goals of the project were (1) to measure the prevalence and distribution of cardiovascular disease (CVD) and associated risk factors in the Mississippi Delta region because other studies have shown that regional rates were higher than those in the state; and (2) to assess environmental perceptions and existing policies that support individuals to make healthy choices. The Delta CHES project focused on clinical care, community outreach, and participant surveys.